Arianism is the theological teaching of Arius (ca. AD 250–336), a Church priest, who was first ruled a heretic at the First Council of Nicea of 325, later exonerated in 335 at the First Synod of Tyre, and then pronounced a heretic again after his death at the First Council of Constantinople of 381. The Roman Emperors Constantius II (337-361) and Valens (364-378) were Arians or Semi-Arians. Arius lived and taught in Alexandria, Egypt . The most controversial of his teachings dealt with the relationship between God the Father and the person of Jesus, saying that Jesus was not of one substance with the Father and that there had been a time before Jesus existed. He denied the divinity of Jesus and claimed that Jesus was one of God the Father's greatest creations. This teaching of Arius conflicts with other christological positions held by Church theologians (and subsequently maintained by the Roman Catholic Church, the Eastern Orthodox Churches and the Protestant Churches). The term "Arianism" is also used to refer to other nontrinitarian theological systems of the 4th century, which regarded the Son of God, the Logos, as a created being (as in Arianism proper and Anomoeanism) or as neither uncreated nor created in the sense other beings are created (as in "Semi-Arianism"). Arius posed the question, "Is Jesus unbegotten?" In other words, he taught that God the Father and the Son did not exist together eternally. Further, Arius taught that the pre-incarnate Jesus was a divine being created by (and possibly inferior to) the Father at some point, before which the Son did not exist. In English-language works, it is sometimes said that Arians believe that Jesus is or was a "creature"; in the sense of "created being." That doctrine that Arius wrote was based on Scriptures such as John 14:28 where Jesus says that the father is "greater than I" to John 17:20-26 where Jesus asks that the Apostles become "one as we are one" so that all of them including Jesus and God become one. This is interpreted as indicating that the oneness refers to thought and will, and not a unity in a Trinity. Of all the various disagreements within the Christian Church, the Arian controversy has held the greatest force and power of theological and political conflict, with the possible exception of the Protestant Reformation. The conflict between Arianism and Trinitarian beliefs was the first major doctrinal confrontation in the Church after the legalization of Christianity by the Roman Emperor Constantine I. The controversy over Arianism began to rise in the late 3rd century and extended over the greater part of the 4th century and involved most church members, simple believers, priests and monks as well as bishops, emperors and members of Rome's imperial family. Yet, such a deep controversy within the Church could not have materialized in the 3rd and 4th centuries without some significant historical influences providing the basis for the Arian doctrines. Most orthodox or mainstream Christian historians define and minimize the Arian conflict as the exclusive construct of Arius and a handful of rogue bishops engaging in heresy. Of the roughly three hundred bishops in attendance at the Council of Nicea, only three bishops did not sign the Nicene Creed. However to minimize the extent of Arianism ignores the fact that extremely prominent Emperors such as Constantius II, the first Christian Emperor, and Valens were Arians, as well as prominent Gothic, Vandal and Lombard warlords both before and after the fall of the Western Roman Empire, and that none of these groups were out of the mainstream of the Roman Empire in the 4th century. After the dispute over Arius politicized the debate and a catholic or general solution to the debate was sought, with a great majority holding to the Trinitarian position, the Arian position was declared officially to be heterodox. Lucian of Antioch, though a canonized Saint of the Catholic Church for his eventual heroic martyrdom, had contended for a christology very similar to what would later be known as Arianism and is thought to have contributed much to its development. Arius was a student of Lucian's private academy in Antioch. The Ebionites, among other early Christian groups, may also have maintained similar doctrines that can be associated with formal Lucian and Arian Christology . While Arianism continued to dominate for several decades even within the family of the Emperor, the Imperial nobility and higher-ranking clergy, in the end it was Trinitarianism which prevailed in the Roman Empire at the end of the 4th century. Arianism, which had been taught by the Arian missionary Ulfilas to the Germanic tribes, was dominant for some centuries among several Germanic tribes in western Europe, especially Goths and Lombards (and significantly for the late Empire, the Vandals), but ceased to be the mainstream belief by the 8th century. Trinitarianism remained the dominant doctrine in all major branches of the Eastern and Western Church and later within Protestantism, although there have been several anti-Trinitarian movements, some of which acknowledge various similarities to classical Arianism. According to the teaching of Arius, the preexistent Logos and thus the incarnate Jesus Christ was a created being, of a distinct, though similar, essence or substance to the Creator; his opponents argued that this would make Jesus less than God, and that this was heretical. Much of the distinction between the differing factions was over the phrasing that Christ expressed in the New Testament to express submission to God the Father. The theological term for this submission is kenosis. This Ecumenical council declared that Jesus Christ was a distinct being of God in existence or reality (hypostasis), which the Latin fathers translated as persona. Jesus was God in essence, being and or nature (ousia), which the Latin fathers translated as substantia. Although he was committed to maintaining what the church had defined at Nicaea, Constantine was also bent on pacifying the situation and eventually became more lenient toward those condemned and exiled at the council. First he allowed Eusebius of Nicomedia, who was a protégé of his sister, and Theognis to return once they had signed an ambiguous statement of faith. The two, and other friends of Arius, worked for Arius' rehabilitation. At the First Synod of Tyre in AD 335, they brought accusations against Athanasius, bishop of Alexandria, the primary opponent of Arius; after this, Constantine had Athanasius banished, since he considered him an impediment to reconciliation. In the same year, the Synod of Jerusalem under Constantine's direction readmitted Arius to communion in AD 336. Arius, however, died on the way to this event in Constantinople. This was the same day Arius' own bishop prayed that if his heresy was to be propagated, the Lord take him in death that night- or better, Arius. Some scholars also suggest that Arius may have been poisoned by his opponents. Eusebius and Theognis remained in the Emperor's favour, and when Constantine, who had been a catechumen much of his adult life, accepted baptism on his deathbed, it was from Eusebius of Nicomedia. 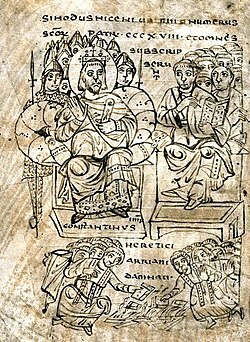 Constantius used his power to exile bishops adhering to the Nicene creed, especially Athanasius of Alexandria, who fled to Rome. In 355 Constantius became the sole Emperor and extended his pro-Arian policy toward the western provinces, frequently using force to push through his creed, even exiling Pope Liberius and installing Antipope Felix II. The debates between these groups resulted in numerous synods, among them the Council of Sardica in 343, the Council of Sirmium in 358 and the double Council of Rimini and Seleucia in 359, and no less than fourteen further creed formulas between 340 and 360, leading the pagan observer Ammianus Marcellinus to comment sarcastically: "The highways were covered with galloping bishops." None of these attempts was acceptable to the defenders of Nicene orthodoxy: writing about the latter councils, Saint Jerome remarked that the world "awoke with a groan to find itself Arian." After Constantius' death in 361, his successor Julian, a devotee of Rome's pagan gods, declared that he would no longer attempt to favor one church faction over another, and allowed all exiled bishops to return; this had the objective of further increasing dissension among Christians. The Emperor Valens, however, revived Constantius' policy and supported the "Homoian" party, exiling bishops and often using force. During this persecution many bishops were exiled to the other ends of the Empire, (e.g., Hilarius of Poitiers to the Eastern provinces). These contacts and the common plight subsequently led to a rapprochement between the Western supporters of the Nicene creed and the homoousios and the Eastern semi-Arians. Two days after Theodosius arrived in Constantinople, November 24, 380, he expelled the Homoian bishop, Demophilus of Constantinople, and surrendered the churches of that city to Gregory Nazianzus, the leader of the rather small Nicene community there, an act which provoked rioting. Theodosius had just been baptized, by bishop Acholius of Thessalonica, during a severe illness, as was common in the early Christian world. In February he and Gratian published an edict that all their subjects should profess the faith of the bishops of Rome and Alexandria (i.e., the Nicene faith), or be handed over for punishment for not doing so. However, during the time of Arianism's flowering in Constantinople , the Gothic convert Ulfilas (later the subject of the letter of Auxentius cited above) was sent as a missionary to the Gothic barbarians across the Danube, a mission favored for political reasons by emperor Constantius II. Ulfilas' initial success in converting this Germanic people to an Arian form of Christianity was strengthened by later events. When the Germanic peoples entered the Roman Empire and founded successor-kingdoms in the western part, most had been Arian Christians for more than a century. The conflict in the 4th century had seen Arian and Nicene factions struggling for control of the Church. In contrast, in the Arian German kingdoms established on the wreckage of the Western Roman Empire in the 5th century, there were entirely separate Arian and Nicene Churches with parallel hierarchies, each serving different sets of believers. The Germanic elites were Arians, and the majority population was Nicene. Many scholars see the persistence of Germanic Arianism as a strategy that was followed in order to differentiate the Germanic elite from the local inhabitants and their culture and also to maintain the Germanic elite's separate group identity. The Franks were unique among the Germanic peoples in that they entered the empire as pagans and converted to Nicene(Catholic) Christianity directly, guided by their king Clovis. The inhibiting and paralyzing force of superstitious beliefs penetrated to every department of life, and the most primary and elementary activities of society were influenced. War, for example, was not a simple matter of a test of strength and courage, but supernatural matters had to be taken carefully into consideration. When Clovis said of the Goths in southern Gaul, "I take it hard that these Arians should hold a part of the Gauls; let us go with God's aid and conquer them and bring the land under our dominion", [note: see p. 45 (Book II:37)] he was not speaking in a hypocritical or arrogant manner but in real accordance with the religious sentiment of the time. What he meant was that the Goths, being heretics, were at once enemies of the true God and inferior to the orthodox Franks in their supernatural backing. Considerations of duty, strategy, and self-interest all reinforced one another in Clovis's mind. However, it was not always the orthodox side that won. We hear of a battle fought a few years before Gregory became bishop of Tours between king Sigibert and the Huns, [note: Book IV:29] in which the Huns " by the use of magic arts caused various false appearances to arise before their enemies and overcame them decisively. Medieval Study Guide to Gregory of Tours History of the Franks. In the west, organized Arianism survived in North Africa, in Hispania, and parts of Italy until it was finally suppressed in the 6th and 7th centuries (in part due to the advance of Islam). Later, during the Protestant reformation, a religious sect in Poland known as the Polish Brethren were commonly referred to as Arians due to their rejection of the Trinity. In many ways, the conflict around Arian beliefs in the fourth, fifth and sixth centuries helped firmly define the centrality of the Trinity in Nicene Christian theology. As the first major intra-Christian conflict after Christianity's legalization, the struggle between Nicenes and Arians left a deep impression on the institutional memory of Nicene churches. Archbishop Dmitri of the Orthodox Church in America said Islam is the largest descendant of Arianism today. There is some superficial similarity in Islam's teaching that Jesus was a great prophet, but very distinct from God, although Islam sees Jesus as a human messenger of God without the divine properties that Arianism attributes to Christ. Islam sees itself as a continuation of the Jewish and Christian traditions and reveres many of the same prophets, though Islam denies the crucifixion and resurrection of Jesus and historical Arians claimed it. Thus, over the past 1,500 years, some Christians have used the term Arian to refer to those groups that see themselves as worshiping Jesus Christ or respecting his teachings, but do not hold to the Nicene creed. Despite the frequency with which this name is used as a polemical label, there has been no historically continuous survival of Arianism into the modern era. There have been religious movements holding beliefs that either they, or their opponents, have considered Arian. To quote the Encyclopaedia Britannica's article on Arianism:"In modern times some Unitarians are virtually Arians in that they are unwilling either to reduce Christ to a mere human being or to attribute to him a divine nature identical with that of the Father." However, their doctrines cannot be considered representative of traditional Arian doctrines or vice-versa.Another religious movement with a strong Arian strain is the Jehovah's Witnesses. Jesus Christ is considered divine but not equal to the one God. Sarah Parvis, Marcellus of Ancyra And the Lost Years of the Arian Controversy 325-345 (New York: Oxford University Press, 2006).